China’s bullet-train builders are on track for a tie-up that might help secure membership of an elite club. At first glance, merging CNR and CSR into a domestic monopoly sounds like a step backwards. But it would help China better compete against an oligopoly of big, rich-world rivals. For a growing superpower, that probably seems a good enough reason to bend the market norms. CNR and CSR are already pretty large. They were the top two global manufacturers of rail vehicles by new sales in 2012, according to consultancy SCI Verkehr. Melding them together would make a behemoth with $32 billion of sales last year. The combination, which Chinese state media said on Oct. 28 is under discussion, would also see an experiment with market forces come full circle. The formation of two train companies in the early 2000s – one in the north and one in the south – was a reformist move to bring competition to the industry. By contrast, this latest idea would give them power to dictate prices to China’s national rail operator. The groups look evenly matched on paper. CSR made $8.1 billion in sales in the six months ending June, roughly 30 percent more than CNR. But their gross margins were similar, around 19 percent. Pooling research and development could save on costs and add 14 percent to last year’s combined earnings, Barclays estimates. But China may have its eyes on a bigger prize. High-speed rail is more a global than domestic industry, and most countries only have one big supplier. Awkwardly, both Chinese rivals put in bids to build a line in California. Having two contenders for projects in a small club of companies like Siemens and Hitachi is distracting. A tie-up could help in the same way forming the trans-national airplane maker Airbus helped Europe compete with U.S. rival Boeing. Should the union happen, Chinese steel groups, and municipal operators who buy trains, may lose out. Regulators would need to keep a close watch. But consumers are likely insulated, as train fares in China are tightly regulated anyway. If a combined group helps China compete abroad and become a credible, high-tech train maker, it might leave citizens better off. 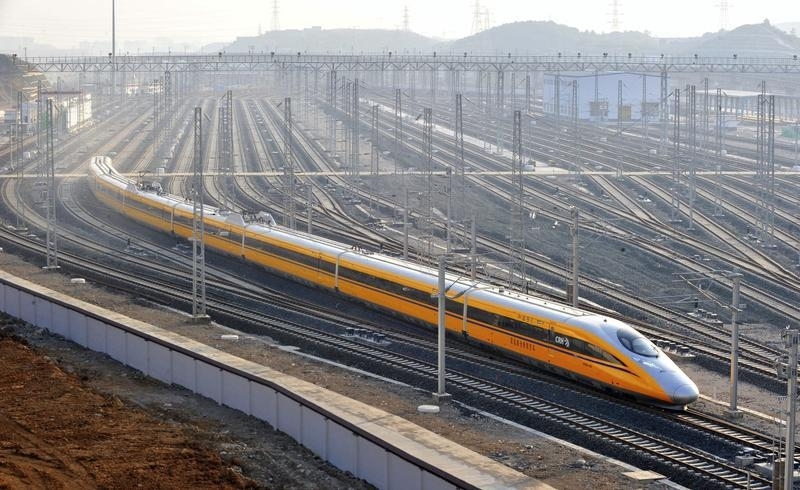 A CRH (China Railway High-speed) Harmony bullet inspection train leaves a train station for a railway inspection assignment, in Guiyang, Guizhou province October 8, 2014. Chinese trainmakers China CNR and CSR are in talks to merge forming a single Chinese rolling stock group, state media said on Oct. 28. China Securities Journal said the companies had set up working groups to discuss the integration, and that investment bank China International Capital Corp had been appointed to oversee the reorganisation. The combined group would have had revenue of 193 billion yuan ($31.6 billion), based on 2013 full-year figures, and earnings of 9.3 billion yuan, before any synergies. High-speed trains made up a quarter of CNR’s revenue in that year. CNR and CSR’s shares, listed in both Hong Kong and Shanghai, were suspended from trading on Oct. 27. A statement from CNR said the companies would resolve “major issues” as soon as possible, and that trading would resume within five working days.